AMD needs something special - can it manage it? AMD's latest card, the Radeon HD 6870, is here and, well, you can colour us fairly unimpressed. AMD has had a good year. An incredible year. Twelve month's ago it was the first to market with a DirectX 11 graphics card and has reaped the rewards for managing it. The tech inside that first 5870 core has filtered down to more affordable cards, with the 5770 currently selling by the bucket load. The 5850 has defined exactly what we should expect from next generation cards. It's helped AMD sell 25 million DirectX 11 cards in total. That's 90% of the DirectX 11 market, which isn't too bad really. Looking to continue the good times, AMD has just launched its second generation of DirectX 11 graphics cards, in the form of the 6870, along with it's slightly more affordable sibling, the 6850. 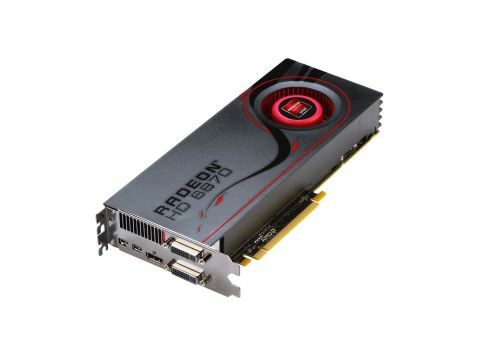 In order to make room for these new cards AMD, which has dropped the ATI name entirely now, will cease manufacturer of the 5870 and 5850. Don't be fooled into thinking that the 6870 and 6850 are direct replacements for the outgoing cards though, as the benchmark results will testify: things aren't that straightforward. This is confused slightly by the fact that the 5770 and 5750 will continue as is. The Radeon HD 6870 uses the 'Barts XT' core for its shenanigans, which is a slightly refined take on the 5800 series core. You'll have to wait until the 6900 cards packing the 'Cayman' core for a truly radical makeover, which will hit the shelves in a month's time. In the meantime, this more-mainstream card is a cross between the 5830 and 5850. You get the full-fat 32 ROPs as found on the 5850, but with a core configuration of 1,120 stream processor, as found inside the 5830. This tweaked core operates at a far higher clock rate to either of these predecessors though, cranking along at 900MHz, as opposed to the 750MHz of the 5850 and the 5830's 800MHz. In real terms this means that the 6870 is faster than the 5850, but it's notably slower than the 5870. As we said, don't be fooled by the name. There's more to AMD's new chips than simply upping the frequency of its core though, and the previous years dominance of the DirectX 11 market has ushered in a new era for developers working with AMD. Eyefinity, for instance, has been welcomed with open arms, with games developers embracing the extra screen space offered by the technology to build more immersive games. Something ably demonstrated at the 6870 launch event, where everything from Civ V through to Medal of Honor to Deus Ex: Human Revolution was demonstrated using Eyefinity. It's not just a case of developers stretching the viewport either, as the UI has been controlled to stay on the main screen where applicable. Eyefinity isn't for everyone, but for those with the desktop space, it's an obvious way of upgrading your visuals.